But this stuff can be really expensive too, so once I’ve invested in some yummy dairy goodness, I want to make sure to protect it. For years, I’ve wrapped cheese in unbleached parchment (or waxed) paper, stashed it in ziploc bags, tried to put the remains back into the original wrapper. The inevitable results was that unless I went through that cheese fast, I always ended up with cheese that dried out too soon, or that started to get that funny oily surface that shows it’s on a downhill slide. I was never able to get it to last in good shape till the last delicious morsel, especially for larger blocks of cheese. Then, one wonderful day (I don’t recall whether birds were singing, but they should have been), I spotted something in the cheese section at Coopportunity, our wonderful Santa Monica natural foods store: Formaticum Cheese Paper! 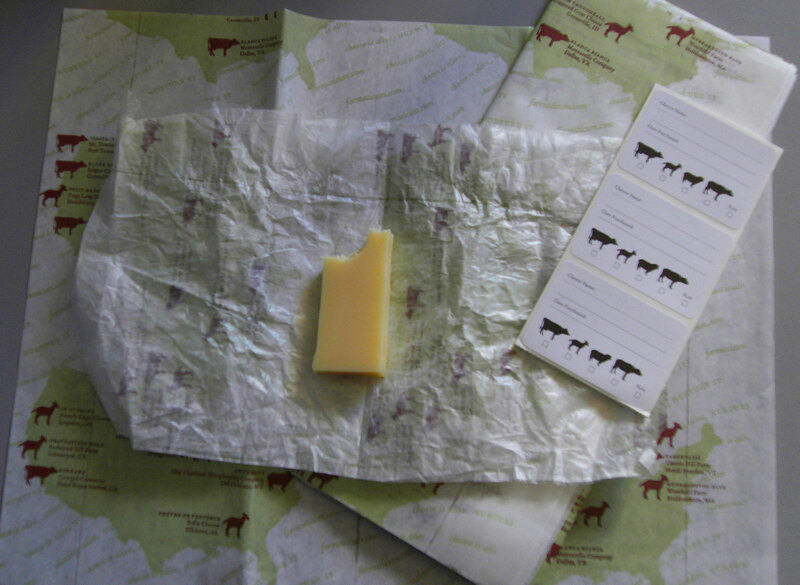 On the package, it claimed to reproduce the atmosphere of a cheese cave (the place where cheese makers stash their wheels of cheese while they age to perfection), albeit in miniature. It was 7 or 8 dollars for the package. It had charming little pictures on the paper, it came with cute stickers to use, it promised to keep my cheese fresh, and I fell for it. Well, let me tell you, this stuff is worth its weight in top-of-the-line cheese! I’ve wrapped chunks and pieces of all different kinds of cheese carefully in the paper, just like I would wrap a package and put them in my refrigerator; they stay just as moist and perfect as they were on the day I brought them home. I am blown away. 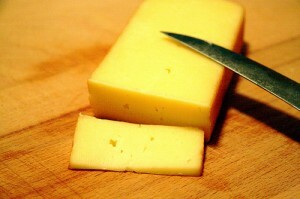 Even Parmagiano, a hunk of which tends to take a while to burn through, stays perfectly grate-ble from first to last. Even better, the pieces are re-usable, particularly with careful handling, and I’ve used some of them five or six times before they got a little rip. I didn’t end up using the stickers (I’m probably going to open and close the packages more than once, and don’t want to tear them each time), but the wrappings seem to stay closed as long as I store them folded side down. You can’t really see it in the photo above, but each piece of paper is two layers: a matte, flexible paper lined with a very sheer, non-stretchy kind of plastic. You can cut the generously sized sheets down to smaller sizes as needed; I find that half sheets work perfectly for most pieces that I get at Coop or Whole Foods. 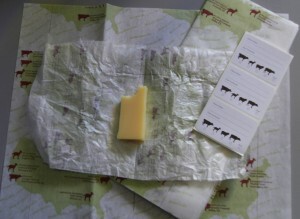 The paper is made in France, where they know a thing or two about cheese. If you’re in Los Angeles, head over to Coopportunity and grab a package; if you’re elsewhere, you can get it on Amazon (the package looks different, but it’s the same product) or check out the Formaticum website for stores (they have a few very entertaining videos on their site showing how to properly wrap cheese, too). Anyway, thought you should know about this terrific product so you can bring it into your own kitchen and pantry!